For the next few weeks (at least) I want to focus on how to begin eating a Plant-Based Diet. Even if you’re not ready to give up meat and dairy entirely I hope to encourage you to include more fruit and vegetables in your diet. If you are an all or nothing kind of person I would advise you to commit to a diet free of any animal products for at least 30 days. If that seems more difficult than climbing Everest then try to add more whole foods and slowly eliminate animal products. It was definitely easier for me than I thought, more difficult for my husband, and the hardest on my now three year old. My husband still wants steak occasionally and my three year old asks for cheese regularly. My one year old has always been plant-based and has a love of fruit and veggies of which I am envious. This weeks Meal Plan is made up of simple foods that can be found in any grocery store, with the exception of maybe couscous. Couscous is really yummy and easy to make, if you’ve never tried it, you should. The taste reminds me of pasta. If this Meal Plan doesn’t seem tasty to you take a look at previous Meal Plans or Recipes. Breakfast is usually quick things like oatmeal, toast, smoothies, fruit with almond butter or left over pancakes. Also we usually eat twice in the morning, once when we get up and once mid morning. I recommend rolled oats or steel cut oats, they take a few extra minutes to cook but they keep you full longer. A typical bowl of oatmeal for me will include cinnamon, diced banana, craisins, and maybe some seeds or nuts, a splash of real maple syrup adds an extra sweet touch as well. Lunch is often leftovers, PB&J, Not So Tuna Salad, leftover Baked Potato, a spinach and hummus wrap or something easy. If I’m feeling really motivated I might make pancakes or soup with veggie odds and ends. Snack is a must at our house. Hummus makes a regular appearance. I shared on Facebook how I could not find hummus or chickpea’s in the small town my mom lives in and had major hummus withdrawal. Some of my family members had never heard of or had hummus but it is one of my favorite things these days. I like to eat hummus with raw veggies like carrots or spinach. I don’t always have humus so sometimes I eat leftovers for snack or fruit or smoothies. Dinner is the meal that gets the most attention. We all eat the same thing even my one and three year old’s. My one year old has a wheat/gluten allergy so most of what I make now is wheat/gluten free. I’m new to this so I’m still transitioning and figuring it out. Monday: Baked Potatoes (make extra for easy lunches) topped with steamed veggies, beans, or chili. Tuesday: Beans and Brown Rice served in a bowl or tortillas. You can used canned beans or make your own which is cheaper. Make extra brown rice for a quick lunch. If you’re not sold on eating brown rice try mixing white and brown rice until you acquire a taste for it, it will happen just ask my husband. 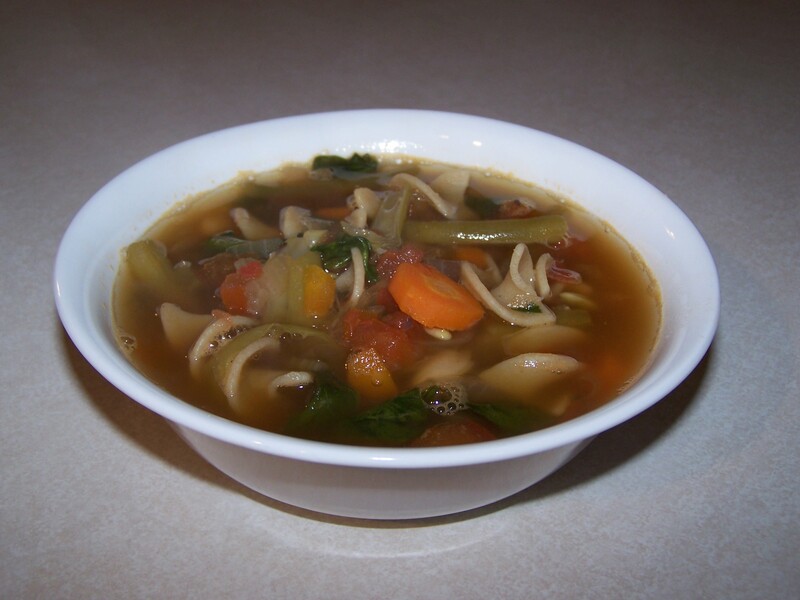 Wednesday: Minestrone Soup is easy to make and soooo delicious. I’ll be using wheat/gluten free noodles in this soup. Last time I made it I didn’t make nearly enough and graciously let my husband take some of the leftovers for lunch even though I secretly wanted to hide it and keep it all to myself. Shh don’t tell him! He was always the guy who didn’t like soup so just give this one a chance. Thursday: Couscous with roasted veggies like onions, peppers, broccoli, and mushrooms. I may even marinate them in balsamic vinegar and veggie broth for a little while before cooking them if I am organized enough that day. Friday: Typically a date night for me and my husband so the kids get baked sweet potato or something just as easy while we eat hummus from Pita Jungle. I don’t plan out our weekend meals because I like to use up leftovers and cook as little as possible. I will usually soak beans and cook them on the weekend. If you cook a big pot you can save some to eat during the week and store some to put in the freezer for a quick meal. Do you have any questions about eating a plant-based diet? Feel free to ask in the comments, email me at myplantbasedfamily@gmail.com, or for the quickest reply ask on My Plant-Based Family’s Facebook page. I love eating vegan and vegetarian meals, but my husband and 3-year-old daughter really enjoy eating meat. I’m trying to transition myself to be able to eat this way every day, without infringing upon their food preferences too much and affecting our shared meals (I should add: I’m the primary cook). I’ve already drastically cut down on the amount of meat I cook in a variety of recipes, and I’ve added lots more fruits and veggies to our meals, which is a start. Do you have any ideas for meals I can make that are flexible for all of our eating preferences? This is the biggest struggle I have had — I want to eat vegetarian meals, but I don’t want to cook two separate dinners, and I want to allow them to eat a little meat at dinner if they choose to do so. Any advice? Hi Clara, I want to commend you for taking on such a big job. I know how tough it is make a meal that hopefully everyone will like, and be healthy. It sounds like your off to a great start. In your situation I think meat can be added to a lot of Plant-Based Meals. To cut down on cooking maybe you can cook several chicken breast, or whatever meat your family enjoys on one day to add to their meals throughout the week. Stir-fry’s with chicken or beef added, baked potatoes topped with bbq chicken, veggie pot pie with cubes of chicken added. Pasta is another dish where cooked meat could be added. We LOVE Mexican food. I think it is some of the easiest to veganize and alternatively to add meat to. I love lentil or quinoa taco’s or burrito’s but ground beef could easily be added to those. Long before we considered going plant-based I would add beans to the ground beef to make for a cheaper more fiber filled meal. Does that help? What are some of their favorite meals? That was very helpful! I think cooking a certain type of meat (or more than one type) ahead of time is actually a great idea that I haven’t considered. I may try that next week! I’ve cooked a bunch of baked potatoes on Sunday for the whole week a few times and I like that approach. We love Mexican foods too so burritos, tacos, and fajitas are pretty common on our menu, and I even tried homemade enchiladas last week (with homemade sauce!) — I just did half w/meat and half w/o meat, so that worked out well. I try to do one pasta dish per week, and one dish with rice per week, but maybe if I cook the meat ahead of time, I can keep that separate before combining my veggies and pasta or rice. Thanks again! Yea! I’m glad to help. It sounds like you do a great job planning already! Enchilada’s are the best, especially homemade! You should try Portobello Fajita’s I was pleasantly surprise since I was never a mushroom lover. This should be a really interesting and helpful series of posts, Holly! Great rundown, Holly! You are a total inspiration to those thinking about trying a new way of eating (and your husban too – what a sport!) – I love the detail you present here! Also, inspiring me to bake more potatoes whole. Great leftovers!